When creating a dessert for your bodybuilding meal plan, always understand the need to minimize sugars and fast acting carbohydrates. A perfect dessert which is easy to make is a high protein chocolate pudding. It minimizes sugar intake, limits fast acting carbohydrates and is nearly fat free. In a mixing bowl whisk the water, milk, and pudding mix for 2 to 3 minutes. Try to ensure the ingredients are well mix. – Add your 2 scoops of protein, mixing as you add. Ensure a nice consistency. – Once all your ingredients are mixed thoroughly, pour them into a dish of your choosing and refrigerate. It should take 5 to 10 minutes to cool. Although the above recipe is a delicious dessert that should be able to fit in any meal plan, there are also additional changes that can be made to it’s flavor profile. Should your macronutrient or caloric intake allow you to, you can add the following to your high protein pudding. Warning, it cannot be emphasized enough that prior to adding these additional foods to your high protein pudding, ensure you are not going over your recommend daily caloric and macronutrient needs. 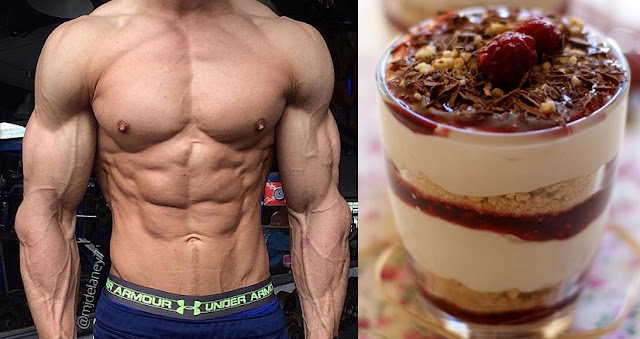 Previous articleHow To Eat To Gain Muscle Fast and Build The Body You Want!